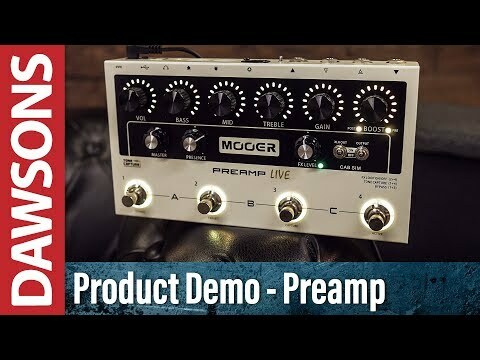 The Mooer Preamp Live Electric Guitar Preamp Pedal is a compact solution for the gigging musician. With intuitive controls and 12 independent preamp channels, you'll find a wealth of depth for shaping and boosting your tone. The Mooer Preamp Live is designed to provide a vast array of tone at your feet in one compact unit. With 12 independent preamp options you can pick from a selection of 50 amplifier models, so whether you want to add an additional option, merge with your existing amplifier tone or simply boost your regular signal. With USB and Bluetooth connections, you can deep edit your amplifier sounds via PC, Mac or mobile to sculpt your perfect tone. If you ever wished you could add more flexibility to your current rig then this is the pedal for you. The Mooer Preamp Live has pre and post boosters as well as adjustable pre and post noise gates, customisable for each preamp channel. Independent speaker cab sims for each output give you the option for direct connection to front of house. Fully programmable FX loop with serial and A/B modes for use with external effects or combining with your own preamp using the 4-cable method. With a headphone slot for silent practice as well as fully mappable MIDI IN and OUT the functionality of this pedal is second to none and the features are endless. With a wealth of connection options, there are plenty of different ways to utilise the Mooer Preamp Live. In Mode A (serial) you can use the pedal in a 'traditional' fashion, whereby the FX Loop comes after the preamp section of the pedal, going out to your power amp, mixing desk or both. Mode B (A/B) bypasses the preamp section of the pedal so you can utilise your head/combo when your FX loop is engaged, utilising the 4-cable method. The multiple channels allow you to switch back to the Mooer Preamp Live at any point. Lastly, you have the innovative 'Tone Capture' feature. This allows you to create an advanced EQ stage based on sampling of external equipment, meaning you can sample the sound of any amplifier that has an FX loop and keep it stored within the pedal. The ability to save and export means you can share your tones with friends and every channel on the Mooer Preamp Live has the ability to store a 'Tone Capture' setting so you don't have to limit yourself to just one amplifier sound.